The Global Cleantech Innovation Programme for SMEs in SA (GCIP-SA) recently opened its call for applications, with 26 April 2017 as the closing date. The initiative aims to spur local technology innovations in energy efficiency, renewable energy, water efficiency, waste beneficiation, green building, and green transportation, in support of the country’s national priorities. The programme combines an annual competition and a business accelerator programme where SMEs and start-ups are continuously trained, mentored and assessed on their business models, investor pitches, communication and financial skills for the development of a more marketable and investor-attractive product and business. Participants are also offered the opportunity to connect with potential partners, clients and investors, participate in showcasing events and have a chance to win a cash prize and a trip to San Francisco to compete with the best cleantech innovators from eight other GCIP countries. The GCIP-SA is part of a global initiative with the goal of promoting clean technology innovation and supporting SMEs and start-ups. In South Africa, the programme is jointly implemented by the United Nations Industrial Development Organization (UNIDO) and the Technology Innovation Agency (TIA), with funding from the Global Environment Facility (GEF). US-based Cleantech Open serves as the main knowledge partner of the global programme. Top performers from the GCIP-SA walked away with top honours at the Cleantech Open Global Forum in San Francisco in February 2017. 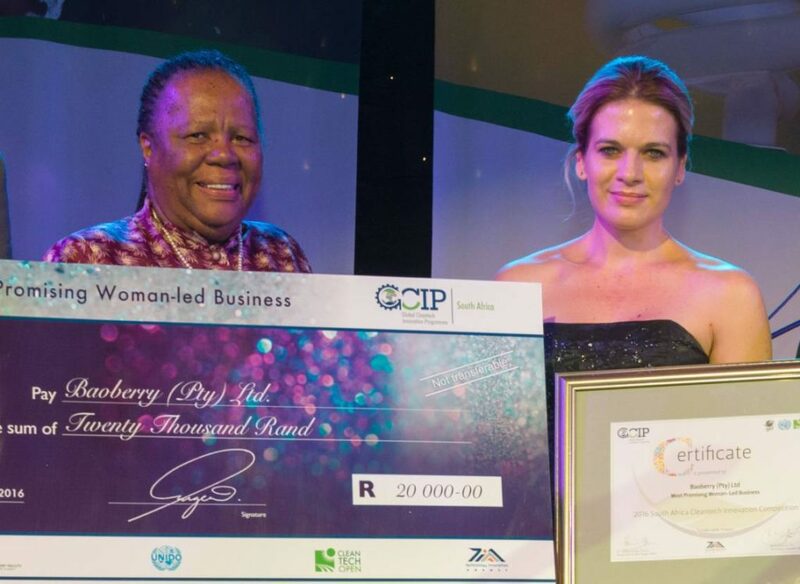 2016 GCIP-SA winner Yolandi Schoeman of Baoberry was one of two runner-up teams for her innovation, aWetbox (a wetland in a box), a cost-effective, nature-based grey water treatment system that eliminates 99% of disease-causing micro-organisms and improves water quality for household use by up to 80%. Fellow 2016 GCIP-SA top performer Martin Ackermann of Thevia was the winner in the Green Building category at the Global Forum for the Thevia roof tiles, made from 99% waste materials. The tiles are twice as strong and 25% the weight of normal cement tiles, and are produced at a similar manufacturing cost. Ackermann states that the GCIP-SA is much more than just a business accelerator. “We became part of an international community of like-minded people focused on working together, helping each other to make the world a better place,” he says. The GCIP-SA also produced the previous overall global Cleantech Open winner, with 2015 GCIP-SA winner Dave Lello of Ekasi Energy receiving the top award for his smokeless, safe and efficient micro-gasifier stove. “The GCIP content and process is worth much more than any prize at the end,” says Lello. Applications for the 2017 GCIP-SA competition and accelerator close at midnight on 26 April 2017, and should be submitted online at www.southafrica.cleantechopen.org.